The speed of vessels operating near endangered killer whales in Washington is the most influential factor—more so than vessel size—in how much noise from the boats reaches the whales, according to a new study published today in the online journal PLOS ONE. 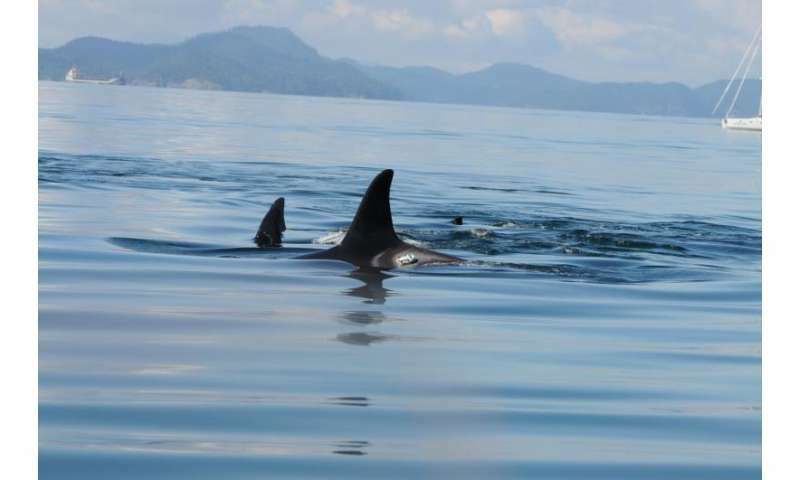 Previous studies have shown that Southern Resident killer whales alter their behavior in the presence of vessels and associated noise, which affects their ability to communicate and find food. Research has also found that the whales likely expend extra energy to call more loudly when boats are operating nearby. The new study by scientists from the University of Washington and National Oceanic and Atmospheric Administration (NOAA) Fisheries is the first to examine how much noise from individual boats reaches the whales in the inland waters of Washington and British Columbia, where they are a popular attraction for recreational and commercial whale watching vessels. "It definitely seems that speed is the most important predictor of the noise levels whales experience," said Juliana Houghton, a recent graduate of the UW's School of Aquatic and Fishery Sciences and lead author of the study. The whale watching fleet has increased from fewer than 20 commercial boats in the 1980s to roughly 80 boats serving about 500,000 people a year, with an estimated $70 million value to the economy of Washington and British Columbia. In addition, the whales are frequently in the vicinity of ferries as well as private whale watching, fishing, and shipping vessels. NOAA Fisheries has identified vessel traffic and noise as one of three main threats to recovery of the endangered population of resident killer whales, which now numbers about 80 animals, and has focused research on measuring and understanding the effect on the whales. These results and other studies will inform a NOAA Fisheries review of the effectiveness of vessel regulations over the coming year. "The goal was to understand this missing but assumed link between what we see at the surface and what the whales experience at depth," Houghton said. Researchers temporarily attached digital acoustic recording tags, or DTAGs, to the whales with suction cups to track the amount of boat noise reaching the animals. 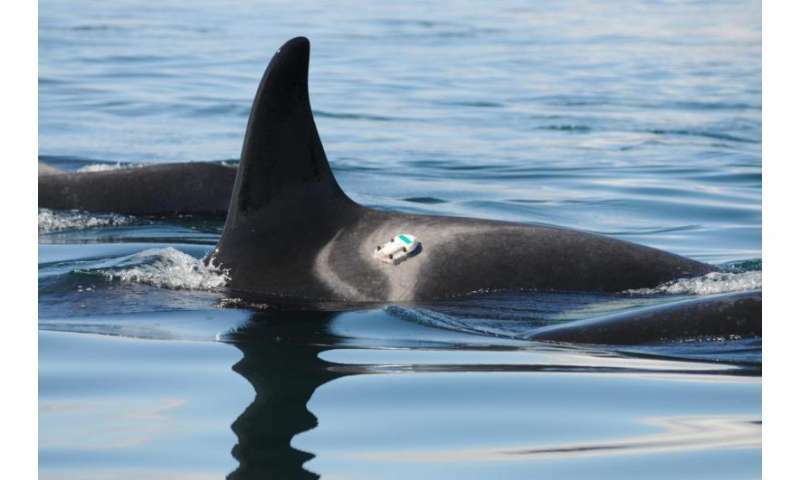 The tags include hydrophones that record sound until they automatically detach from the whales after a few hours. Meanwhile a laser positioning system on a nearby research boat tracked vessels within 1,000 meters, or more than a half-mile, recording their size, speed, location and vessel type. Researcher and co-author Deborah Giles of the University of California, Davis developed the system. The DTAGs and laser positioning system helped scientists overcome the limitations of previous studies that looked only at noise in the whales' environment and counted the number of boats instead of looking at the more detailed characteristics of each boat. 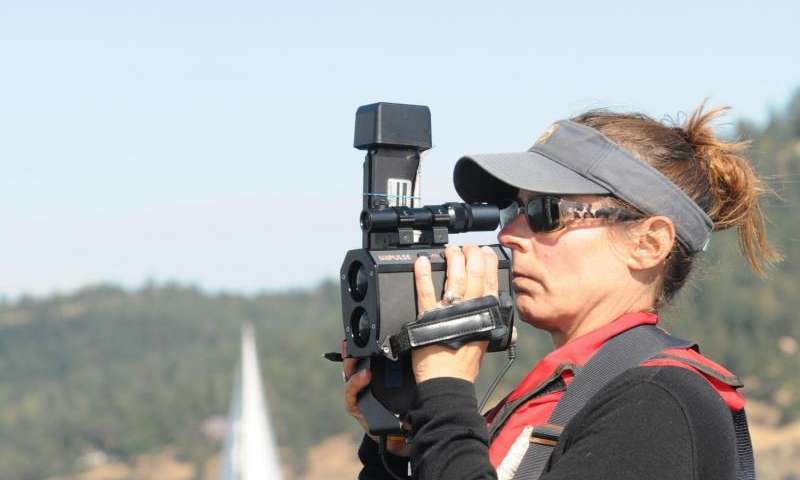 "That combination allowed us to get accurate data on the distance to the whale from each vessel that was in the area, so we could understand how they contributed to noise exposure," said Marla Holt, a NOAA Fisheries research scientist at the Northwest Fisheries Science Center in Seattle and co-author of the new paper. Researchers then compared the characteristics of boats in the area with the sounds recorded by the hydrophones to determine which factors most influenced the noise reaching the whales. The number of propellers and speed of the vessel affected the amount of noise reaching the whales and vessel speed was the most important factor, the study found. Federal regulations require vessels to stay at least 200 yards away from whales and at least 400 yards out of the path of whales. Regulations do not prescribe a speed limit but recommend that boats slow to less than seven knots within 400 yards of the nearest whale and avoid abrupt course changes. The main reason speed is not regulated is the difficulty in enforcing a speed limit and the previous lack of data indicating it was an important factor. The researchers concluded that limiting vessel speed in the vicinity of killer whales would reduce noise exposure of the population. However, Holt noted that noise is not the only factor determining how nearby vessels affect whales. And noise effects depend on what the whales are doing underwater, such as how they are using sound and whether they are feeding or interacting in ways affected by noise.